Vinyl offers an intimate setting with plenty of seating for a prime view of the show and billiards for those just stopping in for a cold beer and a little music. A standard in Atlanta’s local music scene for the past five years, this low-key, high-quality venue for live performances is loved by local and regional musicians and fans alike. 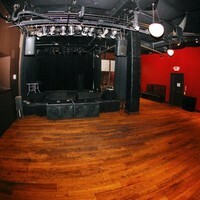 It is part of the Center Stage Atlanta music complex and can accommodate 300 people. Parking: Ample parking is available at reasonable rates in the neighborhood surrounding the Center Stage Atlanta music complex. MARTA: Take MARTA to the Arts Center Station. Exit the station onto West Peachtree Street, and go one block to the right. The venue is located across the street.